You will love the NBA Cleveland Cavaliers Christmas Day Set Plays that are given to us. Christmas Day brought us a rematch of the 2016 NBA Finals between defending champion Cleveland Cavaliers and Golden State Warriors. What was the Warriors Christmas gift? Some déjà vu…another game winning clutch shot by Kyrie Irving. Kyrie Irving dropped a short, turnaround jumper over Klay Thompson with 3.4 seconds left as the Cleveland Cavaliers rallied just like the way they did in June’s NBA Finals to defeat Golden State 109-108 in a Christmas matchup. Trailing by 14 in the fourth quarter, Cleveland chipped away at the Warriors lead and then put the ball (and the game) in Irving’s hands, whose hit a stepback 3-pointer over Stephen Curry on June 19 helped win Game 7 and gave Cleveland its first major pro sports championship since 1964. Golden State had the ball last, but Kevin Durant lost his balance coming off a down screen and stumbled so he couldn’t get his shot as time expired. Despite the struggles on the last possession, Durant lead all scorers with 36 points. Lebron James scored 31 points with a season-high 13 rebounds, Irving added 25 points and Kevin Love 20 for the Cavs. Klay Thompson added 24 points, Draymond Green had 16, and Curry 15 for the Warriors, who had their winning streak stopped at seven. 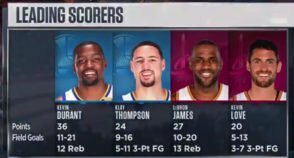 The Warriors and Cavs have produced high quality, high drama basketball. 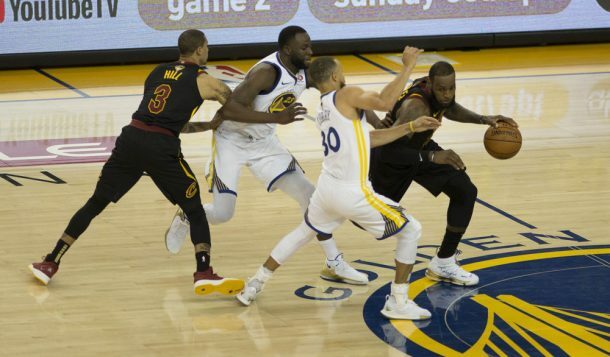 They split the season series and will not meet again unless they both make it back to the NBA Finals, which would be the first time in NBA history in which the same two NBA teams square off against each other three straight years. Despite the big win on Christmas Day, the Cavs have had a rough start to 2017. With a loss to the last-place Dallas Mavericks last night, the Cavs finished the month of January 7-8, including an embarrassing 35 point loss in their final matchup of the regular season with the Warriors. The first losing month of Lebron James’s career. Despite the recent struggles and rumored inter-team and organization chaos, the Cavs remain the team with the best record in the NBA Eastern Conference at 32-15.